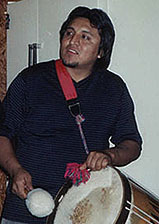 On June 23, 2004 musician Micro Mercado, his wife Suzy and young daughter Mikayla who were killed in an automobile accident in Bolivia. I was lucky enough to know Mirco for the last 4 or so years (and I knew his wife Suzy since 1995) and he made an impression on everyone he met. Over the years whenever we met the conversation would eventual turn to music and his love and enthusiasm for music was always evident. Mirco was a busy man with his music, playing in three different groups. And he left a lasting influence on the Atlanta music scene. No, not the Atlanta music scene of rock and roll (or Country) which seems to dominate the Atlanta press - but the burgeoning Latin American Andean folk music scene, which is the best-kept secret of Atlanta! In one of the most interesting conversations I had with Mirco, he explained his plans to start yet another musical project to mix his traditional music with contemporary rock 'n roll. Immediately, I thought of Ritchie Valens and his Latin-flavored mix of rock 'n roll. Unfortunately, much like Ritchie Valens, we will never know what possibilities we missed in hearing the music that Mirco heard in his head in this regard. To an already busy musical schedule, Mirco added another musical project that was recorded: the group MEBOCHI. In December of 2003, he gave me an early mix of 4 songs from the group's upcoming CD "Sounds of the Andes". I was exited that he was finally leaving a lasting record of his music! In early 2004, Mirco and his wife and daughter traveled down to Bolivia (his home country) to take care of an immigration problem that would allow him to stay in the United States. But there was another task that he was taking care of during his temporary visit to Bolivia: to get the final CD's of MEBOCHI pressed there. He intended on bringing these back to the United States when he returned. In one of my last meetings with Mirco in December of 2003, I decided to record an interview with him. It was going to be the first part of the interview to be printed in EAR CANDY - the second part was to be recorded when he returned with the CD's. Since the band didn't have a CD available at the time or even a website, I figured that I would just wait and publish the whole interview when he got back from Bolivia. But sadly, that was not to be. And since I thought there would be a second interview, I mainly concentrated on the music of MEBOCHI. Unfortunately, the batteries must have been low on the recorder because there is a little tape-drag and there are a few sentences that I could not decipher. But, about 95% of it was clear and I am presenting it here in EAR CANDY. And sadly it is the only record of Mirco talking about the music that meant so much to him. Sometimes life is full of questions that we will never get the answer to in our mortal existence. Especially when someone's life is tragically cut short - a person who had so much promise, zest for life and love of family. It becomes even more tragic when it is a whole family that is suddenly taken. And there are still questions involving MEBOCHI. Who were the other members of the band? Where are the master tapes? Were the finished CD's pressed in Bolivia? Hopefully, we will be able to find answers to these questions. Although Mirco Mercado's life was cut short at 26 years old (the day before his birthday) hopefully soon we will have a lasting record of the music that meant so much to him. And when that CD is found, Mirco will live on through the music. E.C. : Have you decided on a title for the CD? Mirco: We're going to call it "Sounds of the Andes"
E.C. : Is it going to be your name on the CD or is it a group? Mirco: I think the group's name. The name of the group is MEBOCHI. E.C. : What does the group name mean? Mirco: That's just the members of the group…from different parts of Latin America. We have members from Chile, Bolivia and Mexico. So we just picked out the initials of the first few letters of the country. I thought it sounded clearer. We tried some variations, but that's the one we liked. Mirco: So far…there's going to be more - there's going to be eight songs. The first song…the name of the song is "El comtodal cuculi" which means "The Song of the Cuculi". The cuculi is a type of bird of the Andes Mountains. You see, the songs are mostly about nature. If you sing about love, instead of that person's name, you put an animal name. So you could be singing about love. E.C. : Are these all traditional songs? Mirco: They are really traditional. The original don't have any type of strings. So what we did - music evolves you know, we picked out the traditional stuff that we play and we put our own style in. It's kind of...Andean mixed with new contemporary. E.C. : So it is music that you grew up hearing [in Bolivia]? E.C. : What is the second song? Mirco: The second song is called "Montes Punku". It means "The Door To The Hills" or "The Door To The Mountains". E.C. : Tell me about the third song? Mirco: The third song is called "Toyos". Toyos is the name of the "Big Pan Flutes". E.C. : And the fourth song? Mirco: The fourth song is a rhythm originally from Peru. What they dance for ceremonial festivities. Its called "Balichi". E.C. : And what does it stand for? Mirco: "Balichi" - I don't know the translation, it's just a name. E.C. : Is MEBOCHI going to record more songs [for the CD]? Mirco: Yeah, we're going to do more traditional stuff that people know. Ahh…village love songs. E.C. : So, are you going to take these 4 that you have recorded down to Bolivia? Mirco: Yeah, what I'm gonna do. Right now we have 4 songs and next week we're gonna record other songs. So before the 20th of January  do all the mastering and all the copies. They should be done by next year. We try to start with like 2000 [copies]. E.C. : And sell them when you play live? Mirco: Sell them when you play live and we have a web page on the internet that we are working on. And were gonna put it there too. E.C. : How would you describe your music? To someone who hadn't heard it before? E.C. : It has been passed down? Mirco: Yeah, it is the style with traditional pan flutes, drums and guitar. Mirco: Nowadays it is, but it was brought over with the Spanish when they came to South America to conquer Bolivia and other countries. E.C. : So I imagine they band will play a lot more live when you get back from Bolivia? Mirco: Yeah, I mean, the group has been playing a lot for the last 6 years just about. Me myself, I've been playing with three different groups. We play festivals and workshops. The last month I was playing with this company in Atlanta, "Young Latin's of Atlanta". From 1st grade to 5th grade and we show them a little of the culture. At this time there is no website for MEBOCHI and we are trying to find information about the MEBOCHI CD.